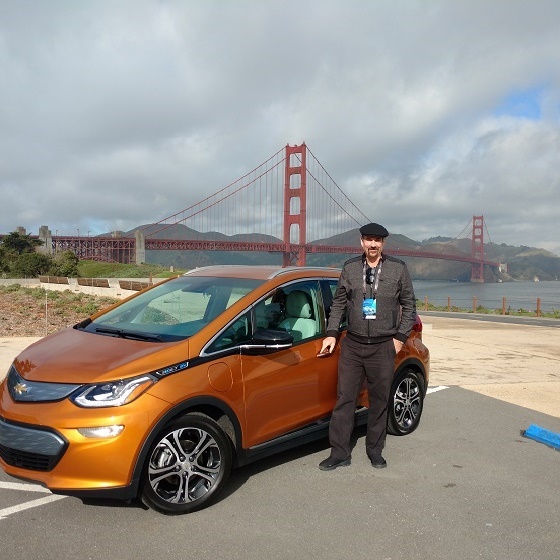 Parks McCants drives the streets and countryside of San Francisco in 2017 Chevy Bolt. I recently experienced Chevrolet’s exceptional 5-door Bolt hatchback on the outback surrounds and streets of San Francisco. Within miles of entering Chevy’ s latest offering in the ever evolving electric car universe, I forgot I was driving a battery motivated electric vehicle. That’s the beauty of 2017 Chevy Bolt, with a stated 230 + mile drive range between charging cycles, range anxiety quickly becomes a non issue. But Bolt’s appeal is much more than extended drive range. Chevy Bolt drives, rides, and feels like a conventional gasoline engine compact hatchback. The brakes, while regenerative, transmit natural hydraulic – like pedal feel back to the driver’s foot. 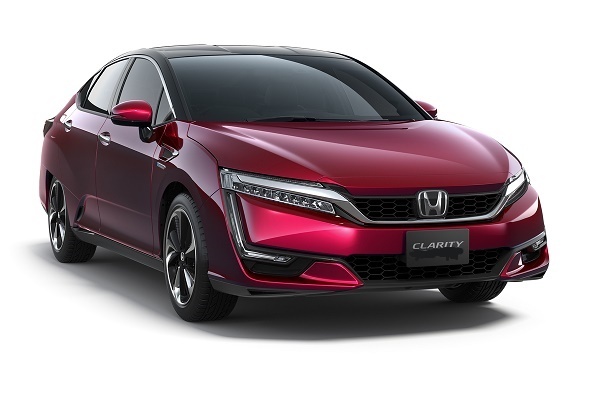 The steering wheel road to driver input, although electric, feels natural, responsive, and easy. 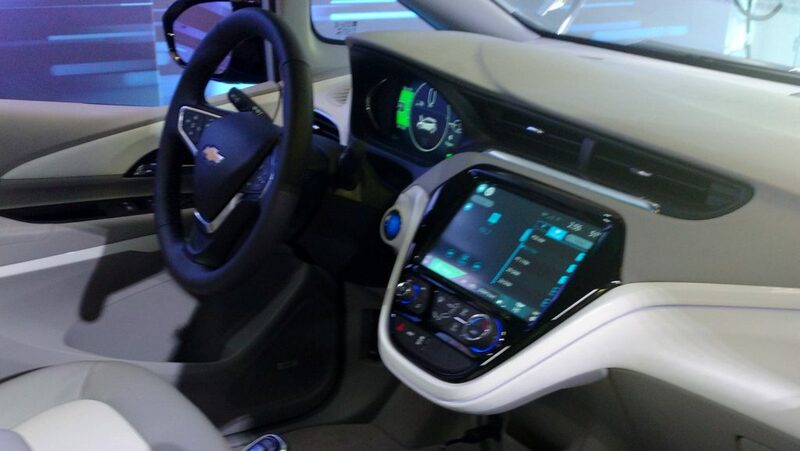 2017 Chevy Bolt EV brings a refined interior to the compact EV segment. Chevy Bolt’s rather pleasant interior is exceptionally comfortable. The driver’s seat was firm, form holding, but not too restrictive. Bolt’s thin profile, foam filled power adjusted driver’s seat, handled my 6 foot 5 inch frame with ease, as did the rear bench. Surprisingly, the compact electric hatchback affords comfortable seating for 4 adults. Yes, 5 can fit in a pinch. With the second row 40/60 split bench folded, one discovers a near flat cargo platform, plenty of transformer-like space back here. 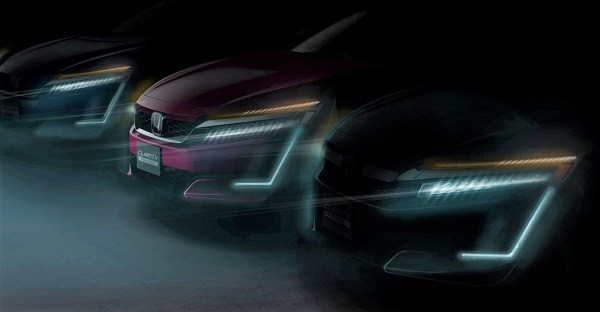 On the downside, visibility through the rear hatch is limited, especially with passengers on board. 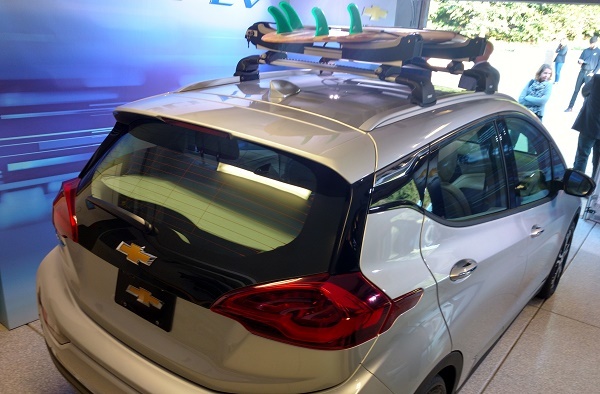 No worries, in top trim Chevy employs a rear cam that double duties as Bolt’s rear view mirror. It takes a moment to get used to, yet, it works well. 2017 Chevy Bolt offers impressive hatchback utility. As I ran my eyes and hand over Bolt’s interior finish and exterior body line, I was taken by how refined Chevy’s answer to a mainstream, long range, affordable electric hatch truly is. As to the drive, I was a bit blown away by the instant-on torque experienced behind the wheel of Bolt, as we navigated the crazy-steep streets of San Francisco. My companion mentioned roller coasters, that it was. Take-off and throttle hesitation is non existent in Bolt EV. 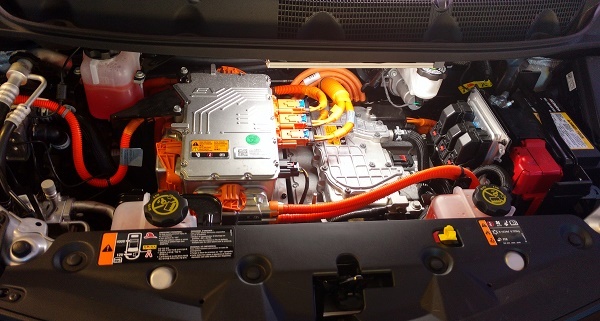 2017 Chevy Bolt, due to its inherent, battery module placement low center of gravity, handles road-sticky through the sweeps, with a larger, cushier car feel, when running at freeway speeds. Passing is effortless, seamless if you will. For those who have never experienced an electric car, the drive dynamic of Chevy Bolt is quite unique, pleasant and down right addictive. 2017 Chevy Bolt features the longest between charge driving range in the segment. On completion of our 6 hour drive circuit, 135 miles remained on the electric range minder. Astounding! Believe me, I didn’t baby 2017 Chevy Bolt. In conclusion: If you were to ask me what I’d change in Bolt, at this juncture, nothing. 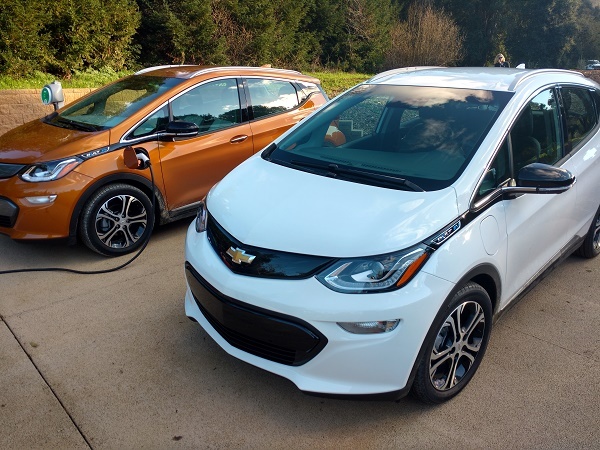 Dollar for dollar, when I compare 2017 Chevy Bolt to any Battery Electric Car on the market today, when it comes to affordable electric car access, utility and extended drive range, Bolt wins, hands down. 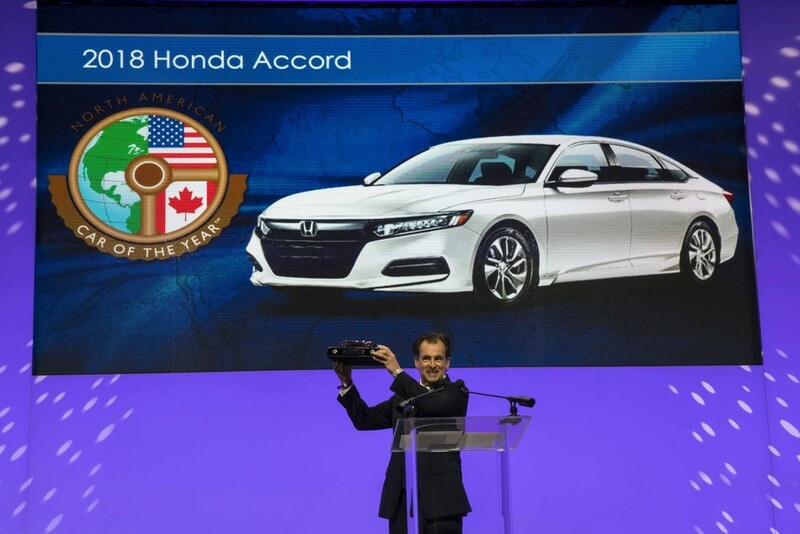 For more information on availability and MSRP, read my first drive impression recap at Torque News.